To study and compare the outcomes of the endoscopic versus microscopic approach to Myringoplasty in 60 patients. 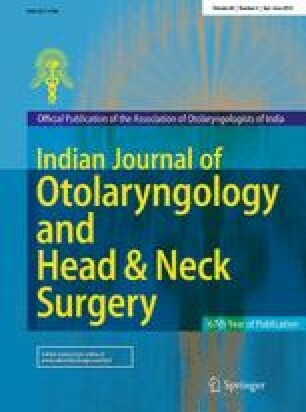 In this prospective study, the outcomes of 60 ears of 60 patients (40 male and 20 female) who underwent Myringoplasty were evaluated. The age range of the patients was 15–55 years. Group 1 underwent Myringoplasty with an endoscopic technique (n = 30), and Group 2 underwent Myringoplasty with the conventional microscopic technique (n = 30). A temporalis fascia graft was used in both groups. The outcomes were analyzed in terms of the hearing gain, duration of surgery, graft success rate and advantages and disadvantages of endoscopic versus microscopic approach to Myringoplasty. In both groups, the postoperative air-bone gap (ABG) was significantly lower than the preoperative ABG. There were no significant differences between the preoperative and postoperative ABG values (in dB) in either group. The mean operative duration in Group 1 (96.32 min) was significantly lower than that in Group 2 (136.09 min). In the preoperative evaluation of patients in Group 1 had small, medium, large perforations are 16 (53 %), 12 (40 %), and 02 (7 %), respectively. In Group 2, had small, medium, large perforations are 12 (40 %), 15 (50 %), and 03 (10 %), respectively. Perforations (wet ear) were detected in 10 (33 %), 06 (20 %), and 04 (12 %) of the patients in Group 1 at postoperative months 1, 3, and 6, respectively. Perforations (wet ear) were detected 09 (30 %), 06 (20 %) and 03 (10 %) patients in Group 2 at postoperative months 1, 3, and 6. At 6 months postoperatively, there were smaller perforations and reduced rate of perforations as compared to 1st and 3rd month in Group 1 and Group 2. The difference between the perforation conditions (larger vs. smaller) was not significant in either group. The preoperative and postoperative increases in the ABG were associated. At the end of 6 months all (100 %) patients in the Group 1 rated their cosmetic result as excellent as compared in the Group 2. Unlike the microscope, the endoscope is easily transportable and hence is ideal for use in ear surgery camps conducted in remote places. In patients undergoing Myringoplasty, especially if the external ear canal is narrow and the anterior canal wall is prominent, the endoscopic and microscopic approaches appear to give equal results in terms of easy visualization of the entire tympanic membrane and no requirement for extra intervention to evaluate the ossicular system. A shorter operative duration and excellent cosmetic result is an advantage of the endoscopic Myringoplasty technique. The authors of this article declare that he/she has no conflict of interest. Animals were not involved in this study.